Find hotel near Kwame Nkrumah Memorial Pa .. 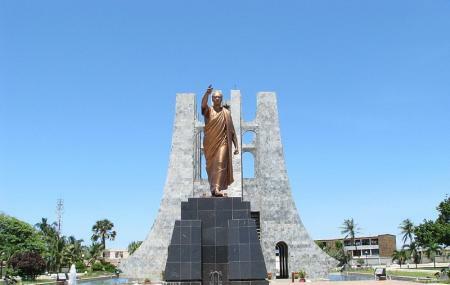 The Kwame Nkrumah Memorial Park houses the mausoleum of the first president of Ghana, named Kwame Nkrumah. Designed by the sculptor Don Aurthus, the mausoleum in the Kwame Nkrumah Memorial Park also houses the body of Kwame’s wife Fathia. The structure looks much like the Akan symbol of peace that is the sword upside down while the black coloured star at the apex signifies unity. Sleek Italian Marble adorns the mausoleum entirely outside and inside. The skylight at the ceiling when lightens up in evening, looks regal. What a calm and peaceful garden. It is a beautiful place to walk round and then visit the museum. After the excessive Ghanaian heat, it was so welcome to go inside the cool dark museum and learn about Kwame Nkrumah, Ghana's first prime minister. Definitely worth a visit. Wonderful powerful and learning the power of Pan African movement and knowing much more work has to be done. Beautiful and pristine park showcasing the Power of Kwame Nkrumah! Go see it! Be an agent of change! Very nice place. Very historical and beautiful. Most natives go there for Photoshoot and site seeing. It's a great tourist site. This is where the first president of the republic of Ghana Dr. Kwame Nkrumah was buried after he died in Guinea Conakry. This place is a tourist attraction and also has a lot of Dr. Nkrumah's books and clothes he wore. A lot can be learnt about the first president of Ghana when visited. There officials there who are ready and willing to take you through a lot of history. Visit there and thank me later.